When I went to Kalmeshwar, Maharastra, India last 22 August to 31 August this year for a plant visit, I brought with me a presentation I made years ago regarding Maintenance Planning for National Steel Corporation. 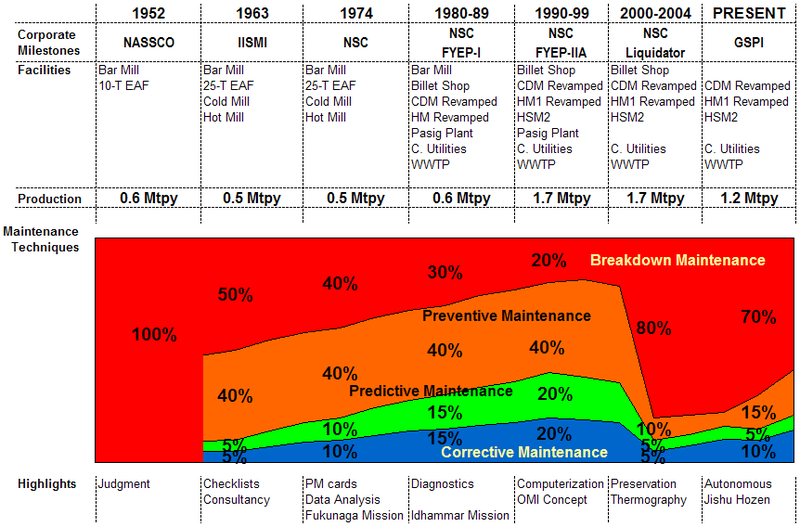 In one of the slides in the Powerpoint, History of Cold-Rolling Mills Maintenance, I used a graphic presented by Cabrera (1990) during the NSC Maintenance Conference in 1990. 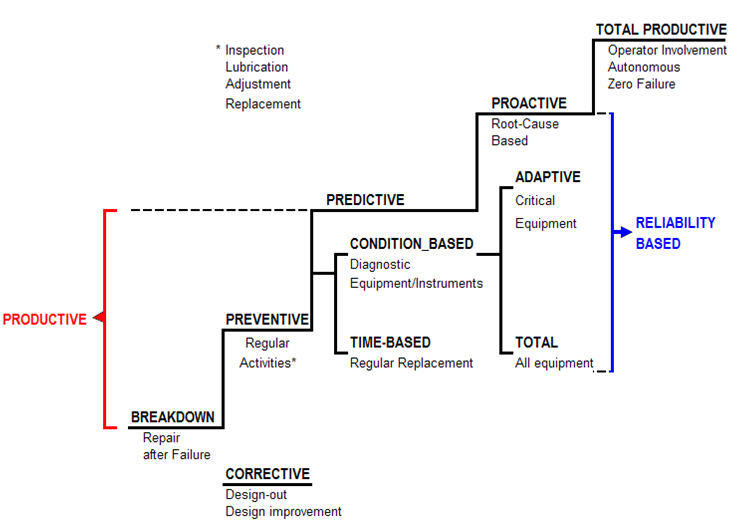 The figure above shows the different maintenance techniques used by NSC from 1952 to 1990. I updated this graphic to include some estimates for those years beyond 1990. I have retained the values for NSC from that Maintenance Conference to be true until NSC closed in 1999. Data for 2000 to 2004 are estimates based on Liquidators reports; wherein only the Plant Facilities Preservation team was present during this phase. Moreover, Thermography was used to monitor equipment status when ocular inspection was not sufficient. For the period starting 2005, or GSPI’s era, these are estimates based on present data. Data from GSPI is as elusive as a dream by Tom Jones, thus the bases of these estimates are from supervisors’ interviews and personal observations. One of the supervisors explicitly estimated that although Corrective Maintenance of GSPI is better than during the Liquidator’s phase, its Breakdown Maintenance is much worse at 70% than at the end of NSC’s era in 1999 at 20%. Preventive Maintenance, moreover, went from 40% to 15%. This would probably because of the lack in maintenance materials and supplies [M&S] to do time-based replacements. Unfortunately, there was no opportunity then for the presentation during the visit.